Fibroblastic growth factor 23 (FGF23) regulates renal phosphate reabsorption and 1α-hydroxylase activity. Ablation of FGF23 results in elevated serum phosphate, calcium, and 1,25-dihydroxyvitamin D3 [1,25(OH)2D] levels; vascular calcifications; and early death. For determination of the independent roles of hyperphosphatemia and excess vitamin D activity on the observed phenotypic abnormalities, FGF23 null mice were fed a phosphate- or vitamin D–deficient diet. The phosphate-deficient diet corrected the hyperphosphatemia, prevented vascular calcifications, and rescued the lethal phenotype in FGF23 null mice, despite persistent elevations of serum 1,25(OH)2D and calcium levels. This suggests that hyperphosphatemia, rather than excessive vitamin D activity, is the major stimulus for vascular calcifications and contributes to the increased mortality in the FGF23-null mouse model. In contrast, the vitamin D–deficient diet failed to correct either the hyperphosphatemia or the vascular calcifications in FGF23 null mice, indicating that FGF23 independently regulates renal phosphate excretion and that elevations in 1,25(OH)2D and calcium are not sufficient to induce vascular calcifications in the absence of hyperphosphatemia. The vitamin D–deficient diet also improved survival in FGF23 null mice in association with normalization of 1,25(OH)2D and calcium levels and despite persistent hyperphosphatemia and vascular calcifications, indicating that excessive vitamin D activity can also have adverse effects in the presence of hyperphosphatemia and absence of FGF23. Understanding the independent and context-dependent interactions between hyperphosphatemia and excessive vitamin D activity, as well as vascular calcifications and mortality in FGF23 null mice, may ultimately provide important insights into the management of clinical disorders of hyperphosphatemia and excess vitamin D activity. On the other hand, vitamin D analogues have the potential to induce toxicity from hypercalcemia and hyperphosphatemia through direct actions to increase gastrointestinal absorption of both calcium and phosphate, as well as to stimulate bone resorption.13 Although small differences may exist between calcitriol and its active vitamin analogues paricalcitol and doxercalciferol with regard to incidence of hypercalcemia and hyperphosphatemia, prospective clinical trials show that all can cause hyperphosphatemia and hypercalcemia, especially at high dosages.11,14 Animal and cell culture studies also support a specific role for vitamin D in mediating vascular calcifications, which is an active osteogenic-like process. In this regard, injection of active vitamin D analogues directly promotes vascular calcification in experimental models, even in the face of controlled phosphorus and calcium levels,15–17 whereas administration of vitamin D to vascular smooth muscle cell cultures accentuates calcifications and osteogenic gene expression.18 The fibroblast growth factor 23 (FGF23)-null mouse model is a relatively novel animal model that illustrates the toxic potential of elevated serum 1,25(OH)2D levels. Deletion of FGF23, the bone-derived hormone that regulates serum phosphate and vitamin D homeostasis,19–21 results in hyperphosphatemia, markedly elevated circulating 1,25(OH)2D levels, extensive vascular calcifications, and early mortality.20 Transfer of 1α-hydroxylase deficiency or the VDR null phenotype onto FGF23 null mice corrects the vascular calcifications and high mortality in these animals, implicating toxic effects of high circulating levels of 1,25(OH)2D levels that are mediated through the VDR in this animal model.22,23 The concomitant correction of both hyperphosphatemia and excessive 1,25(OH)2D activity by the addition of either 1α-hydroxylase or VDR deficiency to the FGF23 null background, however, prevents insights into the separate contributions of excess serum phosphate and 1,25(OH)2D on vascular calcifications and increased mortality. It is unclear whether the dosage of active vitamin D analogues should be limited and/or treatment interrupted in patients who have ESRD with elevated phosphate levels or the potential beneficial effects of vitamin D provides justification for their continued use in the setting of hyperphosphatemia. To address this question, we examined the separate effects of hyperphosphatemia and elevated 1,25(OH)2D on vascular calcifications and mortality in the FGF23 null mouse model. In this study, we placed FGF23 null mice on either a phosphorus-deficient diet, which corrected the hyperphosphatemia but not the elevated 1,25(OH)2D levels, or a vitamin D–deficient diet, which normalized the circulating 1,25(OH)2D levels without correcting the hyperphosphatemia, to determine the individual contributions of serum phosphorus and 1,25(OH)2D to the development of vascular calcifications and early mortality in this mouse model. We found hyperphosphatemia to be the major contributor to vascular calcifications in FGF23 null mice and that in vivo elevations in 1,25(OH)2D in the absence of hyperphosphatemia had no demonstrable toxicity in this model. Compared with wild-type mice, FGF23 null mice on a control diet displayed an age-dependent increase in mortality beginning at 5 wk of age. No FGF23 null mice that received a regular diet survived beyond 14 wk of age (Figure 1A). Also, FGF23 deficiency resulted in severe growth retardation as evidenced by a significant reduction in body weight (Figure 1B). The shortened survival in FGF23 null mice was associated with hyperphosphatemia, hypercalcemia, and elevated circulating 1,25(OH)2D levels (Table 1), consistent with the known actions of FGF23 to inhibit renal phosphate reabsorption and 1α-hydroxylase. Survival and growth curves of wild-type (WT) and fibroblast growth factor 23 (FGF23) null mice after dietary manipulation of phosphate and vitamin D. (A) On a control diet, FGF23 null mice exhibited 0% survival (n = 9) compared with 100% survival of WT mice (n = 6) at 14 wk of age. A significant improvement in survival of FGF23 null mice was observed on both the phosphate-deficient (PD; n = 10) and vitamin D–deficient (DD; n = 9) diets, with 90% of the mice surviving to 14 wk of age. WT mice on both the PD (n = 6) and DD (n = 6) diets had 100% survival rate at 14 wk of age. (B) WT mice that were fed a PD diet had severe (P < 0.01) and mild (P < 0.05) growth retardation, respectively. FGF23 null mice had severe growth retardation on a control diet compared with WT mice (P < 0.01). This growth retardation was not worsened by feeding a PD diet and was improved with a DD diet (P < 0.05). The FGF23 null mice on a regular diet also displayed extensive soft tissue and vascular calcifications that were apparent by 6 wk of age (Figure 2 through 4). Alizarin red staining of tissues from the FGF23 null mice revealed the presence of widespread calcifications in various organs, including the aorta and kidneys (Figure 2) as well as lung (data not shown). Histologic analyses of these tissues demonstrated calcifications of the elastic lamina in medial layer of the aorta (Figure 2C) along with marked calcifications of the small- and medium-sized vessels of the kidney (Figure 3A). Microcomputed tomography (μCT) analysis of the kidneys revealed extensive cortical calcium deposition that correlated with histologic evidence of calcifications of small- to medium-size arteries (Figure 3, A and B). In addition, Fourier transform infrared (FTIR) microspectroscopic imaging analysis demonstrated focal mineral deposition distributed in a manner similar to that exhibited by Von Kossa staining (Figure 4A). In the spectra of the mineral deposits, there is a broad peak at 1082 cm−1 that is associated with the P-O vibration modes (Figure 4B). The broad, relatively featureless contour that characterizes this peak indicates that the mineral spots contain amorphous calcium phosphate but not highly crystallized apatite. 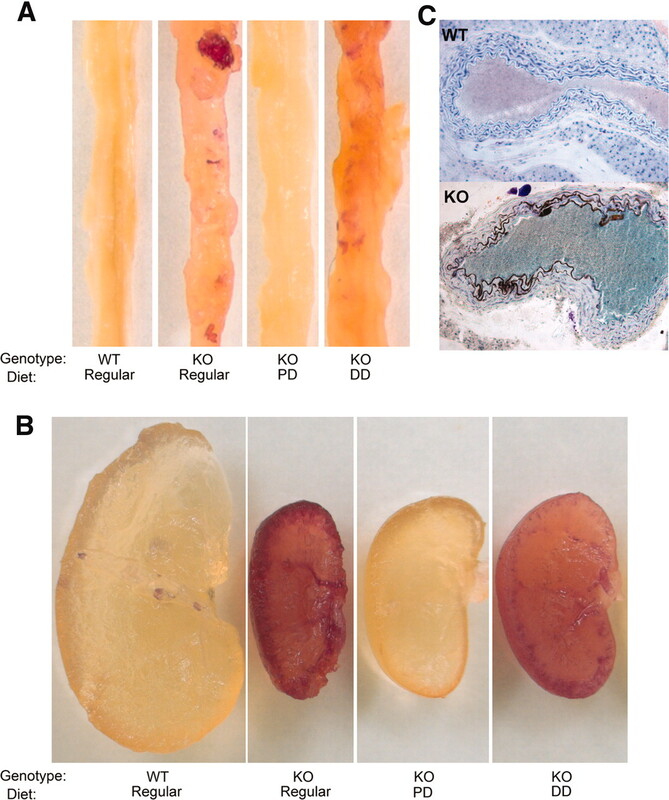 Aorta and kidney calcifications in 6-wk-old WT and FGF23 null mice on various diets. (A and B) Alizarin Red-S staining of mineralization in the aorta and whole kidney in WT and FGF23 null mice (KO). (C) Von Kossa-stained cross-sections of the aorta from WT (top) and KO (bottom) mice. Calcifications of the elastic lamina were present in KO mice on a control diet. The PD diet rescued the vascular and kidney calcifications, whereas calcifications persisted in the DD diet. Magnification, ×200. Histology and microcomputed tomography (μCT) analysis of the kidneys from 6-wk-old WT and FGF23 null mice on various diets. (A) Von Kossa–stained sagittal sections of the kidney showing calcification predominantly in the cortical area (top) and located in small- and medium-sized arteries (bottom). (B) Three-dimensional μCT reconstruction of the sagittal sections of the kidney demonstrating mineralization. The PD diet completely rescued the soft tissue and vascular calcifications in the FGF23 null mice, whereas the calcifications persisted in the FGF23 null group on a DD diet. (C) Ratio of mineralized volume to total kidney volume by μCT analysis. Values are means ± SEM of at least five kidneys. Mineralization was significantly greater in FGF23 null mice on a DD diet (P < 0.01) and absent in FGF23 null mice on a PD diet. Magnifications: ×50 in A, top; ×200 in A, bottom. Fourier transform infrared (FTIR) microspectroscopic imaging analysis of the kidney sections from WT and FGF23 null mice. (A) FTIR microspectroscopic imaging analysis of the kidney. 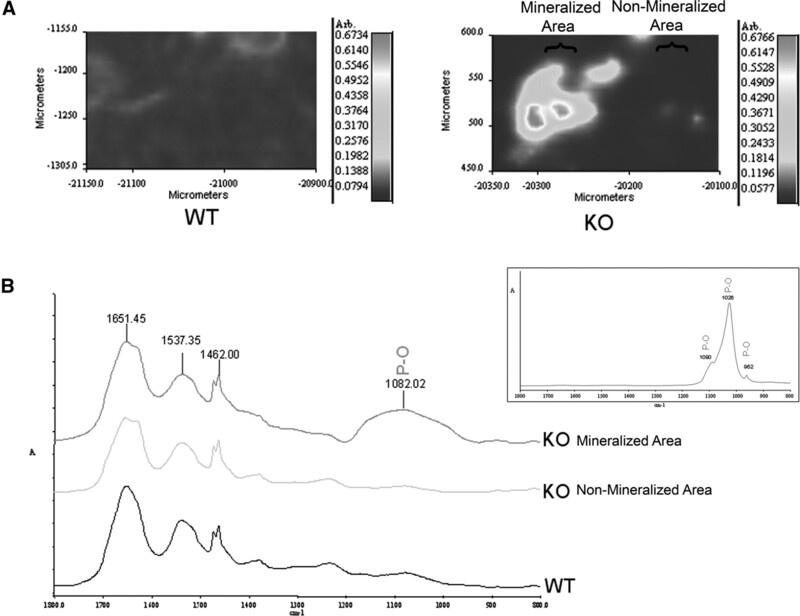 Several mineralized areas were distributed in the cortical zone of the kidney in FGF23 null but not in WT mice. (B) Spectra of the mineralized and nonmineralized areas. In the FGF23 null kidneys on a regular diet, there is a broad peak at 1075 cm−1, which is associated to the P-O vibration modes. This broad and relatively featureless contour of this peak indicates that the mineral deposits contain amorphous calcium phosphate (apatite). An example of the typical analysis for a highly crystallized area of apatite (insert) is shown for comparison. Phosphate restriction of wild-type mice resulted in severe growth retardation as assessed by a 50% reduction in body weight (Table 1) but had no adverse effect on survival (Figure 1). In addition, phosphate restriction in wild-type mice resulted in a marked decrease in serum phosphate levels and a five- to eight-fold increase in serum 1,25(OH)2D levels, attaining values similar to FGF23 null mice. The increase in serum 1,25(OH)2D is consistent with the known effects of hypophosphatemia to 1α-hydroxylase activity.4 Phosphate restriction also increased calcium levels and suppressed serum PTH levels compared with wild-type controls that were fed a regular diet (Table 1). In contrast, FGF23 null mice that were fed a low-phosphate diet displayed marked improvement in survival. 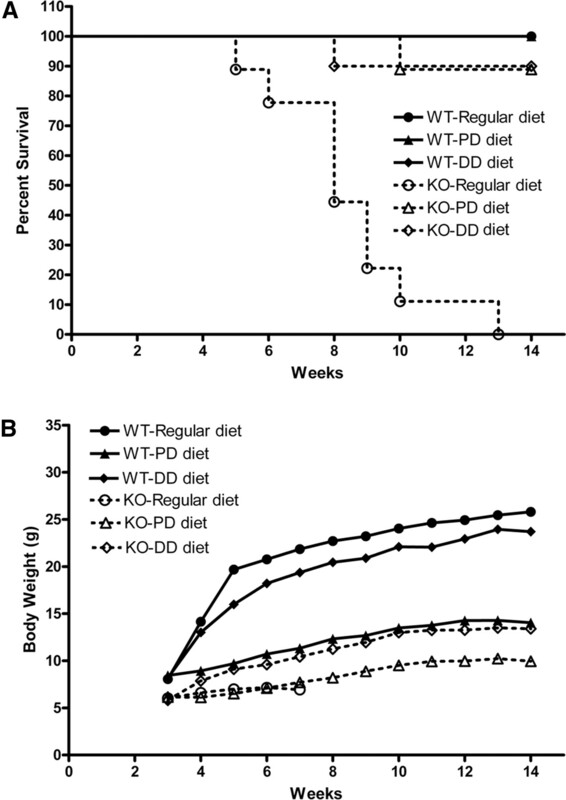 In this regard, a phosphate-depleted diet resulted in 90% survival of FGF23 null mice at the end of the 14-wk observation period (Figure 1) compared with no survivors in FGF23 null mice that were fed a regular diet. Phosphate restriction had no effect on the already low body weight in FGF23 null mice. Dietary phosphate restriction, however, significantly reduced serum phosphate levels in FGF23 null mice (Table 1). 1,25(OH)2D levels remained six- to 10-fold elevated, and hypercalcemia and suppressed PTH persisted in FGF23 null mice that were fed a phosphate-depleted diet (Table 1). The soft tissue calcifications associated with the absence of FGF23 were completely corrected by the phosphate-deficient diet (Figures 2 and 3). In this regard, there were no demonstrable calcifications by alizarin red staining, μCT, or histologic analysis of any tissue, including heart, aorta, and kidney, from FGF23 null mice on a low-phosphate diet, despite hypercalcemia and elevated 1,25(OH)2D levels. Wild-type mice that were fed a vitamin D–deficient diet had a slightly lower body weight and 100% survival. By 14 wk of age, wild-type mice that were fed a vitamin D–deficient diet exhibited elevation of serum PTH, consistent with the induction of secondary hyperparathyroidism. Serum calcium and 1,25(OH)2D were maintained in the normal range, but serum phosphate was decreased in 14-wk-old wild-type mice that were fed a vitamin D–deficient diet. A vitamin D–deficient diet also resulted in improved survival of FGF23 null mice, with 90% of the mice surviving at the end of the 14-wk observation period (Figure 1). The improved survival was not associated with correction of either the hyperphosphatemia or vascular calcifications (Table 1, vide infra). A growth advantage was also noted in the FGF23 null mice on the vitamin D–deficient diet, although these mice remained significantly smaller that wild-type controls. The vitamin D–deficient diet in FGF23 null mice resulted in normalization of serum 1,25(OH)2D and calcium levels but did not fully correct the hyperphosphatemia, because their serum phosphate levels remained approximately 1.5-fold greater than normal. In addition, vitamin D deficiency resulted in an increase in serum PTH levels at 14 but not 6 wk in FGF23 null mice. Soft tissue calcifications in the FGF23 null mice were not prevented by the vitamin D–deficient diet. In fact, there was a tendency for worsening of renal calcifications in the FGF23 null mice on a vitamin D–deficient diet when analyzed by μCT. Quantification of renal calcifications revealed an increase in calcium deposition compared with similar FGF23 null mice on a control diet (Figure 3C). Lowering of 1,25(OH)2D in the FGF23 null mice resulted in a survival benefit in the face of extensive calcifications and persistent hyperphosphatemia, suggesting that elevated levels of 1.25(OH)2D can have adverse effects on survival in this context. In this study, we used dietary manipulation of phosphate and vitamin D to assess separately the contributions of hyperphosphatemia and elevated 1,25(OH)2D on vascular calcification and mortality in FGF23 null mice. Similar to other reports,20,24 we found that the FGF23 null mouse develops a mineral profile and phenotype similar to patients who have ESRD and are treated with high-dosage vitamin D analogues, namely, elevated serum calcium, phosphate, and 1,25(OH)2D levels along with vascular calcifications and decreased survival (Table 1, Figures 1 and 2). By restricting phosphate intake in the FGF23 null mice, we were able to lower selectively serum phosphate levels while maintaining markedly elevated serum levels of 1,25(OH)2D and calcium (Table 1). In contrast, feeding FGF23 null mice a vitamin D–deficient diet resulted in normalization of circulating 1,25(OH)2D levels while maintaining a state of hyperphosphatemia (Table 1). The related finding that markedly elevated 1,25(OH)2D levels in FGF23 null mice on a phosphate-deficient diet had no apparent adverse effects, including failure to stimulate vascular calcifications, suggests that this potential toxicity of high concentrations of active vitamin D is context dependent, being modified by FGF23 deficiency, vascular calcifications, and hyperphosphatemia or other factors. Several clinical studies have also failed to find a relationship between circulating active vitamin D levels and calcifications.26,27 In addition, these findings support the interpretation that the lower mortality associated with the use of less potent vitamin D analogues, such as paricalcitol and doxercalciferol, could be explained by less hyperphosphatemia.11,28 Regardless, these studies are the first to show that restriction of dietary phosphate and lowering of the serum phosphate prevent vascular calcifications and improve survival in a hyperphosphatemic model. As such, these animal studies provide further support for the recommendation to treat aggressively hyperphosphatemia as a potential means of improving survival in patients with ESRD. We also observed context-dependent adverse effects of excessive 1,25(OH)2D levels in FGF23 null mice. In this regard, normalization of 1,25(OH)2D levels by dietary vitamin D restriction neither fully corrected elevated serum phosphorus levels nor rescued the calcification phenotype in FGF23 null mice but paradoxically improved survival, similar to that of phosphate restriction alone.12 Similar to our studies, abolition of vitamin D–dependent activities in FGF23 null mice by creating compound mutant mice that lacked either the 1α-hydroxylase or VDR gene prevented vascular calcifications and prolonged survival in FGF23 null mice.22,29 In these previous studies, however, the 1α-hydroxylase and VDR null mice resulted in correction of both the hyperphosphatemia and excess activation of vitamin D–dependent signaling in FGF23 null mice, thereby precluding the separate assessment of the contribution of hyperphosphatemia and excess vitamin D.
The ability of decrements in circulating 1,25(OH)2D concentrations to have a positive impact on survival without reducing vascular calcifications is opposite to the purported salutary effect of vitamin D treatment in patients with ESRD.9 The potential toxicity of high circulating concentrations of active vitamin D analogues, however, is consistent with the observation that the survival benefit of calcitriol therapy in patients with ESRD is attenuated at high dosages.12 In any event, this study raises new questions regarding the necessity and potential toxicity of supraphysiologic concentrations of circulating 1,25(OH)2D, as well as the potential interactions between hyperphosphatemia and elevated 1,25(OH)2D levels. Previous results from superimposed 1α-hydroxylase or VDR deficiency in FGF23 null mice that completely corrected the hyperphosphatemia suggested a minor function of FGF23 to regulate phosphate transport across the proximal tubule.22,29 The finding of this study, namely that hyperphosphatemia was present in FGF23 null mice (Table 1) in the setting of normal circulating 1,25(OH)2D levels, however, is consistent with an important direct role of FGF23 deficiency to increase renal phosphate reabsorption by the kidney independent of its effects to regulate 1α-hydroxylase activity. The inability to observe the antiphosphaturic effects in FGF23 null mice with ablated 1α-hydroxylase and VDR may be due to the masking of the renal phenotype by decreased gastrointestinal absorption of phosphate. Finally, the relevance of our findings in FGF23 null mice to the potential toxicity of phosphate and excessive activation of the vitamin D axis in hyperphosphatemic clinical disorders, such as tumoral calcinosis,30–34 and hyperphosphatemic patients who have renal failure and are treated with calcitriol analogues, requires further investigation given the limitations of this study. In this regard, the nonuremic FGF23 null mouse model does not address the impact of renal failure, which could contribute additional factors that lead to vascular calcifications and mortality. In addition, although our study clearly demonstrated a survival benefit for both vitamin D and phosphorus restriction in the FGF23 null mice, we are unable to describe the mechanisms behind this improved survival. Last, FGF23 levels are markedly increased in the setting of renal failure,35–37 rather than decreased as in the FGF23 null mice. The function of FGF23 in ESRD is not known. It is not clear whether the biologic effects of FGF23 are increased in ESRD or decreased as a result of a loss of kidney function. Because the kidney seems to function as the main target organ for FGF23, it is possible that the loss of a necessary kidney-derived constituent, such as Klotho, is promoting the exponential elevations of serum FGF23 in the setting of ESRD.38 Regardless, these findings suggest that effective lowering of serum phosphate will have important effects to prevent vascular calcifications. Prospective clinical trials are needed to examine the separate roles of phosphate control and intensity of therapy with active vitamin D analogues on vascular calcifications and mortality in patients with chronic kidney diseases. The results of this study implicate hyperphosphatemia in the pathogenesis of soft tissue and vascular calcifications in FGF23 null mice and support a context-dependent toxic role of excess circulating 1,25(OH)2D. These observations suggest important interactions between hyperphosphatemia and excess 1,25(OH)2D and support the underlying premise of the K/DOQI clinical recommendations to limit the dosage of active vitamin D analogues in the setting of hyperphosphatemia and to strive to achieve lower serum phosphate concentrations.7 In addition, a better understanding of the interactions between hyperphosphatemia and excessive vitamin D activity in the FGF23 null mouse model may provide insights into the management of chronic kidney disease, where hyperphosphatemia and treatment with vitamin D analogues often coexist. FGF23 knockout mice were generated and genotyped as previously reported.21 All mice were maintained and used in accordance with the recommendations in the Guide for Care and Use of Laboratory Animals and by guidelines established by the University of Kansas Medical Center Institutional Animal Care and Use Committee. All diets were purchased from Harlan Teklad (Madison, WI). The phosphate deficient diet contained 0.6% Ca, 0.02% Pi, and 2200 IU vitamin D per kilogram of diet. The vitamin D–deficient diet contained 0.6% Ca, 0.54% Pi, and 1.0 IU vitamin D per kilogram of diet. The regular (control) diet contained 0.6% Ca, 0.54% Pi, and 2200 IU vitamin D. FGF23 null and wild-type mice were individually enrolled in three separate diet arms beginning at weaning. Both body weight and survival were documented weekly from 3 to 14 wk of ages. A cross-sectional collection of serum and tissues was obtained on a separate group of mice on the same diet regimens for comparison at 6 wk of age. Because baseline parameters and dietary responses were identical between heterozygous FGF23-deficient and wild-type mice, their values were combined for data analysis. Blood samples were obtained by retro-orbital bleeding at both 6 and 14 wk of age. Serum calcium and phosphorus levels were measured, respectively, using Calcium Liquicolor (Stanbio Laboratory, Boerne, TX) and phosphomolybdate-ascorbic acid method as described previously.39 Serum PTH was determined by using the Mouse Intact PTH ELISA Kit (Immunotopics, San Clemente, CA). Serum 1,25(OH)2D levels were measured using a 1,25 Dihydroxy Vitamin D EIA Kit (IDS Ltd., Tyne & Wear, UK). Tissues to be stained for calcifications were collected and stored in 70% ethanol. Alizarin red staining was used to stain soft tissue calcifications as previously described.40 Briefly, each individual tissue sample was placed in 10 ml of alizarin working solution that contained 0.8% alizarin red S in 0.5% KOH and rotated for 24 h. The tissues were then removed from the alizarin working solution, replaced in 10 ml of 0.05% KOH, and rotated for another 24 h to remove any unbound stain from the tissues; then a photograph was taken for record. Tissues for histologic analysis were harvested and fixed in 4% paraformaldehyde for 24 h and then embedded in paraffin. Five-micrometer tissue sections were used for Von Kossa and Toluidine blue staining as described previously.21 Ten-micrometer tissue sections were used for FTIR imaging analysis. FTIR microspectroscopic imaging analysis was completed using the Spectrum Spotlight FTIR imaging system (Perkin Elmer, Waltham, MA) with both single-point and imaging mode. Images were scanned between 4000 and 720 cm−1 at 4 cm−1 spectral resolution with two scans per pixel. Image sizes were approximately 300 × 300 μm with 6.25-μm pixel resolution. An atmosphere correction was applied to the raw image to subtract the contribution of atmosphere absorbance (water vapor and carbon dioxide). Images were created using Spectrum Spotlight software. The kidneys from 6-wk-old mice were collected and fixed in 70% ethanol. High-resolution μCT was used to evaluate mineralization of kidney samples (μCT40; Scanco Medical AG, Basserdorf, Switzerland).41 A 100-μm-thick area from the middle of each kidney was evaluated for three-dimensional image and quantitative evaluation of the mineralized kidney volume fraction. We evaluated differences between groups by one-way ANOVA for multiple group comparison and t test for two-group comparison. All values are expressed as means ± SEM. P < 0.05 was considered statistically significant. All computations were performed using the GraphPad Prism 4 software (GraphPad Software, San Diego, CA). This work was supported by National Institutes of Health grant RO1-AR45955 from the National Institute of Arthritis and Musculoskeletal and Skin Diseases and National Institutes of Health grant P20 RR-17708 from the National Center for Research Resources. Portions of this work were previously published in abstract form (J Am Soc Nephrol 17: 689A, 2006) at the American Society of Nephrology Meeting; November 11 through 14, 2006; San Diego, California. J.R.S. and S.L. contributed equally to this work. Increased circulating levels of FGF23: an adaptive response in primary hyperparathyroidism? Vascular Calcification in Chronic Renal Failure: What Have We Learned From Animal Studies? Is Calcitriol Life-Protective for Patients with Chronic Kidney Disease?